AIB, in partnership with Cork based wholesaler, Musgrave, opened a banking outlet in their SuperValu Store in Lucan, Co. Dublin. Customers are offered extended banking opening hours providing a staffed advisory and sales service, ATM’s, cash and cheque lodgement machines. It opens 7 days a week with no tellers handling over-the-counter cash transactions. 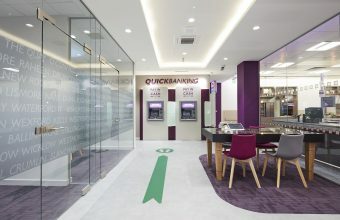 AIB’s written brief scheduled a series of components, functions and machines that needed to be accommodated in the space. 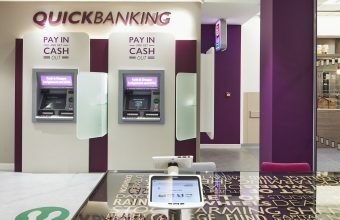 Our concept was not to create a bank but to create a marketing suite – welcoming, light and airy – barrier free where doing business was as easy as the weekly shop. 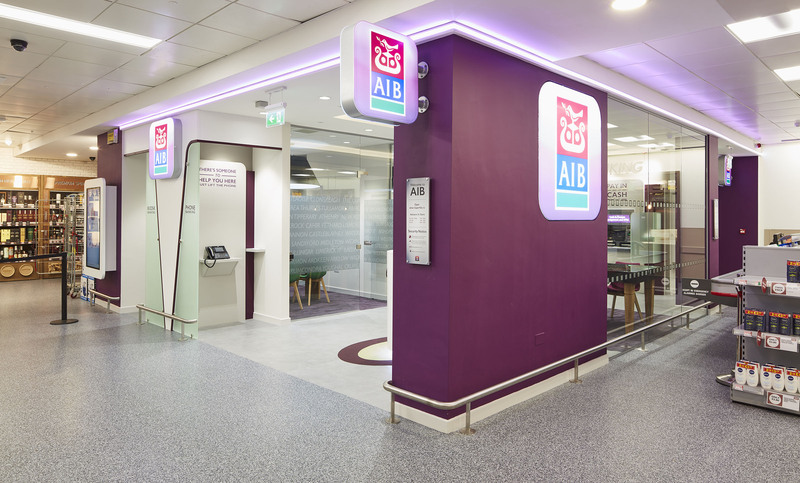 The site offered to AIB was deep within the store – a strong high level coloured LED light was used as a marker to highlight, define and differentiate the AIB space. The outlet, being small, has minimal staff. 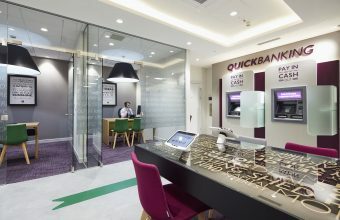 In one of the consultation rooms, a remote advisory desk was designed allowing customers to visually connect directly with head Office staff via computer link. 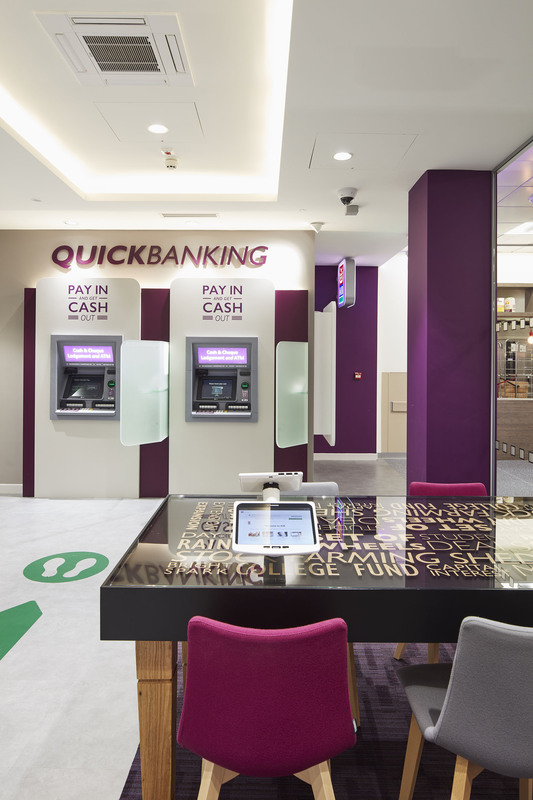 A key challenge was to design a financial services outlet in a space that was normally preserved for food stuffs. The unit had to be secure yet barrier free, open and welcoming, yet comfortable for customers to discuss private affairs. 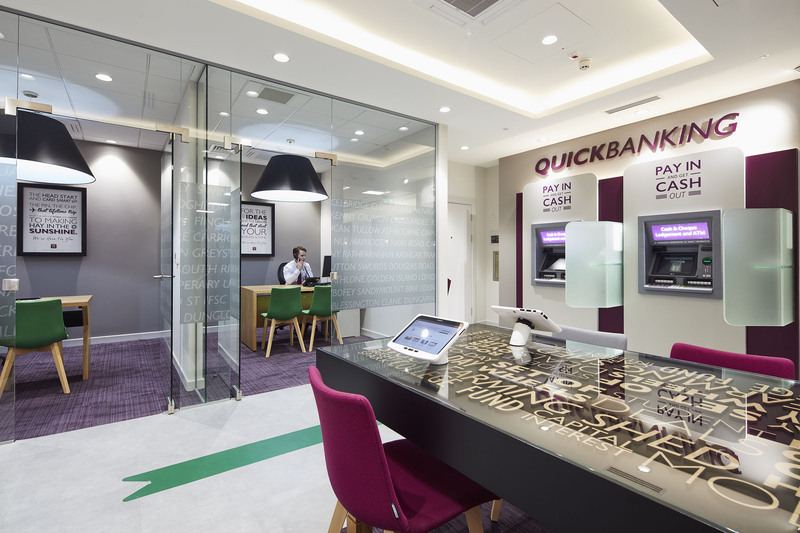 The end result was achieved by understanding the customer journey and creating a series of open and semi-open spaces allowing customers to easily engage with AIB staff and vice versa. A lot was achieved in a small space. The total floor area is 74 sq. m.
This project commenced in mid-June 2016 and completed in mid-July 2016. 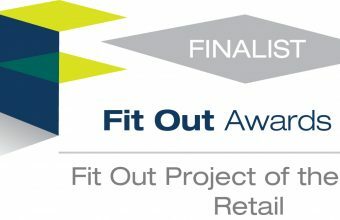 “Oppermann Associates were fantastic to work with. 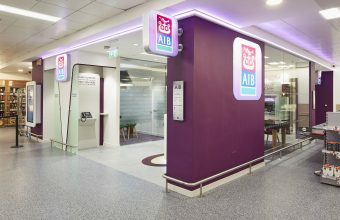 They listened to all our concerns and the end result is a branch that is contemporary, functional and welcoming” – Martin Conway, Capital Projects & Programme Manager, AIB Group.